Just like the crises of lower-income immobility and middle class insecurity, the crisis of special-interest privilege is not Barack Obama’s fault. It predates his presidency. And though his policies have made it worse, past Republican presidents and Congresses share some of the blame. Too many in Washington have convinced themselves that special-interest privilege is wrong only when the other side does it. We [Republicans] have tried being a party of corporate connections and special-interest deal-making. And we’ve lost five of the six presidential popular votes since [Reagan left office]. Properly considered, there is no such thing as a conservative special interest. While I agree, I have a more ecumenical view of the issue. In economic warfare, the fighting can never be fair for long, and it is the business of the state to see that its own friends are victorious. I won’t dispute that many progressives continue to view things this way. But I think there is value in framing the elimination of government-granted privilege in terms that attract progressives to the cause rather than in terms that seem destined to repel them. Our financial markets have an important role to play. They are supposed to allocate capital and manage risk. But they’ve misallocated capital and they’ve created risk. We are bearing the cost of their misdeeds. There’s a system where we socialized losses and privatized gains. That’s not capitalism, that’s not a market economy, that’s a distorted economy and if we continue with that we won’t succeed in growing, and we won’t succeed in creating a just society. Those words could have come out of Milton Friedman’s mouth. The verdict is nearly unanimous that economic regulation over rates, entry, mergers, and technology has been anticompetitive and wasteful. Green and Nader’s concern about regulatory capture wasn’t just an academic exercise. It helped propel one of the most successful eliminations of government-granted privilege in U.S. history: the deregulation of trucking, air travel, and freight rail in the late 1970s. To the considerable benefit of consumers, these industries were substantially deregulated and de-cartelized. And it happened because liberals like Ted Kennedy and Jimmy Carter eventually joined the cause. Our task today is to get modern libertarians, conservatives, and progressives to once again rally against government-granted privilege. This entry was posted in Government-Granted Privilege and tagged Barack Obama, deregulation, economy, financial markets, Herbert Croly, Heritage Foundation, Jimmy Carter, Joseph Stiglitz, Milton Friedman, Nobel Laureate, Nobel Laureate Joseph Stiglitz, political privilege, regulation, tax, Tea Party, Utah, Utah Senator Mike Lee, Washington, Zuccotti Park on May 2, 2014 by Matt Mitchell. The great tragedy of the financial crisis, however, was not that Washington regulations failed to prevent it, but instead that Washington regulations helped lead us into it. Even putting aside the issue of causality, my colleague Robert Greene and I recently examined the data on regulatory growth as we sought to answer the question, “Did Deregulation Cause the Financial Crisis?” Our conclusion was that there was no measurable, net deregulation leading up to the financial crisis. The data on regulatory growth came from RegData, which uses text analysis to measure the quantity of restrictions published in regulatory text each year. 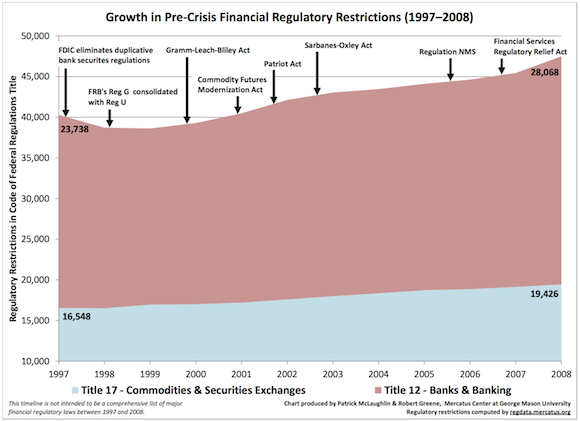 The graph below shows the number of regulatory restrictions published each year in Title 12 of the Code of Federal Regulations, which covers the subject area of banks and banking, and Title 17, which covers commodity futures and securities trading. Deregulation would show a general downward trend. Instead, we see that both titles grew over that time period. The only downward ticks we see occurred because of some consolidation of duplicative regulations from 1997 to 1999 (see our article for more details on that). [W]e find that between 1997 and 2008 the number of financial regulatory restrictions in the Code of Federal Regulations (CFR) rose from approximately 40,286 restrictions to 47,494—an increase of 17.9 percent. Regulatory restrictions in Title 12 of the CFR—which regulates banking—increased 18.2 percent while the number of restrictions in Title 17—which regulates commodity futures and securities markets—increased 17.4 percent. This entry was posted in New Publications, Regulation and tagged American Banker, CFR, consolidation, deregulation, financial crisis, growth, Jeb Hensarling, myth of deregulation, regulation, Robert Greene, Washington on September 24, 2013 by Patrick McLaughlin.